Icebreaker is a Viking-themed physics game, in which you try to rescue Vikings that have been trapped in ice by strategically cutting the ice and dropping them into a boat. It's almost like Fruit Ninja, only there's no fruit, no Ninjas, and you don't have to be very fast. You do have to slash things apart to win, though. In Icebreaker, you sometimes have to use hammers to fling Vikings across the screen. The first few Icebreaker levels are straightforward: There's a boat floating on a lake, and a Viking is conveniently trapped in ice just above the boat. Stretch a line across the ice, and the Viking plops into the boat, still encased in ice. A fellow Viking with a hammer is waiting on the boat, and as soon as a chunk of ice arrives on deck (with or without a Viking), the Viking starts hammering at it to break it apart. If the block of ice is too large, the Viking will simply keep hammering in vain--you must then cut it down to a size the Viking can handle. 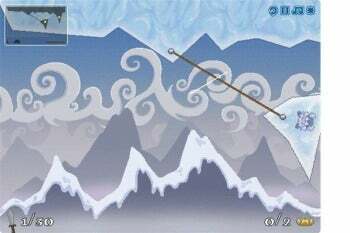 Later levels of Icebreaker introduce interesting mechanics: For example, a block of ice that looks like a hammer is floating in the middle of the screen, attached by two pins. Slice through it in the right spot and it breaks away from one pin and pivots on the other, hitting a Viking poised in its path. The Viking flies across the screen, and (with luck) lands somewhere on the boat's roomy deck. 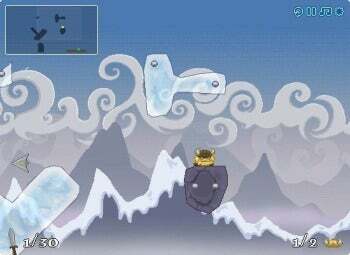 Other levels require making an even slope for Vikings to slide down, or slicing several chunks of ice in the correct sequence. Timing can be important in Icebreaker, like when you must cut a Viking loose when the momentum is just right. Icebreaker doesn't feature in-game ads (aside from a brief one at startup), which is especially nice in a browser-based game. The soundtrack is repetitive, but you can easily mute it. If you like Vikings, ice, and slicing things--and really, who doesn't?--Icebreaker would be just about perfect for you. Note: The Download button takes you to the vendor's site, where you can play this game in your Flash-enabled browser after watching a brief advertisement. Icebreaker is a physics puzzler where you must rescue Vikings trapped in ice.